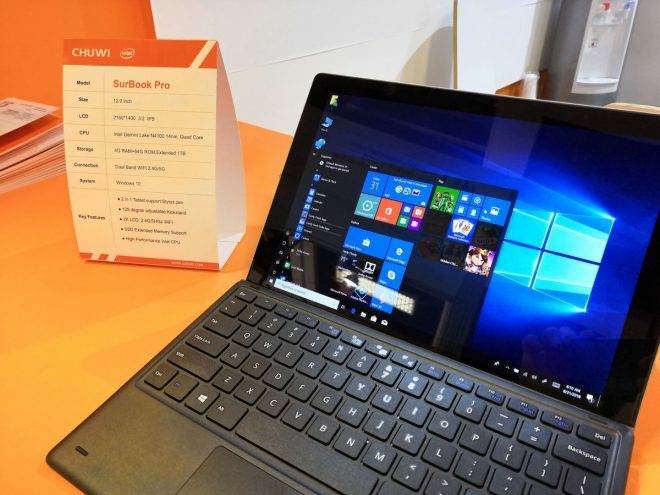 A new 12-inch Windows 10 2-in-1 tablet called Chuwi SurBook Pro was unveiled at IFA for launch later this fall, with an Intel Celeron N4100 processor onboard. 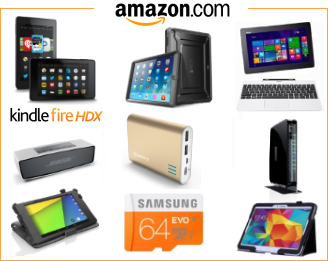 Only the main specs have been announced to date, but they are sufficient to pique an interest in the tablet. Specifications includes a 12-inch 3:2 ratio screen with 2160 x 1400 resolution and pen support. The Intel Celeron N4100 “Gemini Lake” processor is followed by hardware such as 4GB of RAM, and 64GB of storage which is extendable to 1TB, Chuwi says. As we saw recently, the new Crucial BX500 SSD costs just $79 with 480GB. Other than that we only learn that the Chuwi SurBook Pro has dual-band Wi-Fi, a built-in kickstand, and other Surface type of features, including a typical Surface style keyboard. With the Intel Celeron N4100 processor, the Chuwi SurBook Pro will be up against the likes of Alldocube KNote 5, and Lenovo Tablet 10, and also the N4200 powered Acer Switch 3. Chuwi also says it will launch an Intel Atom Z8350 and 4GB RAM powered Chuwi Surbook SE Windows 10 2-in-1 at 10.1 inches in 2018, though it’s difficult to understand why at this point in time, as this would lead to a frustrating user experience for most people, even though fast RAM can help. The tablet brand already have the 10.8-inch Windows tablet Chuwi SurBook Mini in their portfolio, which is powered by the more powerful Intel Celeron N3450 processor, with 4GB of RAM and a Full HD display. 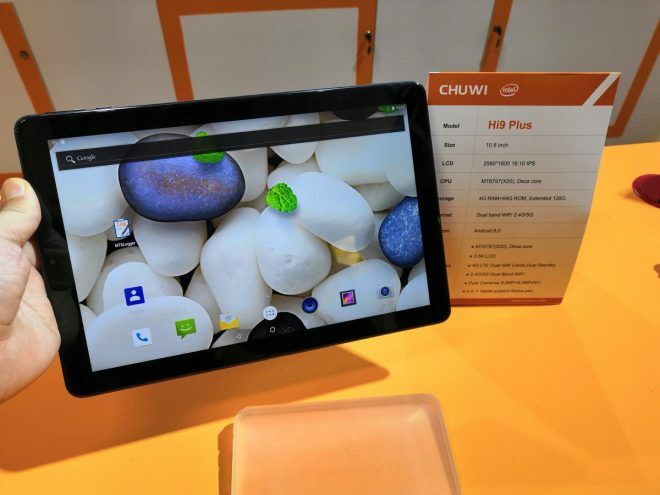 Chuwi also used the opportuity to announce the Android 8.0 tablet Chuwi Hi9 Plus, which is a 10.8-inch alternative to the Chuwi Hi9 Air.